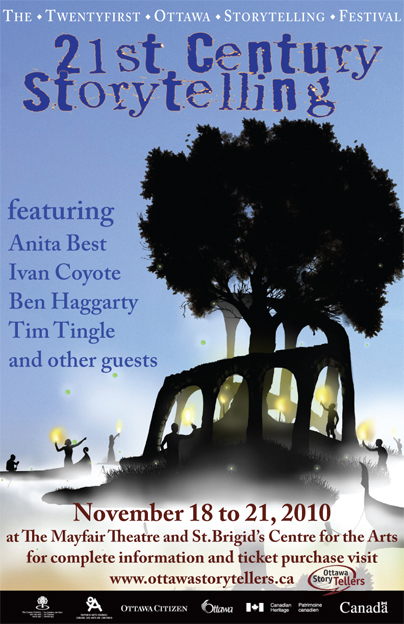 Welcome to the Ottawa StoryTeller 2010 festival page! For the 21st Ottawa Storytelling Festival we are bringing some of the best performers from Canada, the United States and Europe to present four days of dynamic storytelling. We’ll kick off the Festival with a performance at the atmospheric Mayfair Theatre on the 18th, followed by a film screening. Over the next three days we will offer workshops and other activities at Saint Brigid’s Centre on the Byward Market, followed by feature concerts in the evening and late-night performances. From personal tales of family, home, and identity to the historic drama of the youngest inmate ever sentenced to Alcatraz, from a steampunk reimagining of Mary Shelly’s Frankenstein to a celebration of ballads and tales from the shores of Newfoundland, the Festival will truly offer something for everyone.